Popplers are undeveloped Omicronian young. They are born in large pits on an unattended, nursing type-M planet, watched over by nanny cams. These larval Omicronians have an irresistible taste to humans and many alien species. Popplers were first discovered by hungry Planet Express employees Fry, Bender and Leela. The taste of the then-unknown objects was so addictive that they filled the Planet Express Ship and brought them to Earth, where an exclusive deal was struck to serve them at Fishy Joe's fast food restaurants. Fishy Joe's sold Popplers for $1.99 a dozen. The Planet Express crew made $1 per dozen. 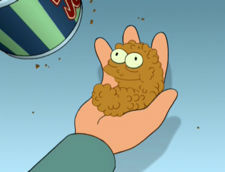 Therefore each Poppler would be worth about ¢16.583... Kif Kroker stated that 198 billion Popplers had been sold and then they would have made Fishy Joe's about $16.3 billion. Bender initially suggested calling them "Taste-icles", but it sounded too much like "Testsicles". When informed that the only two names not trademarked were "Popplers" and "Zitzers," they agreed on Popplers. The word "Poppler" can be re-written as "pop Lrrr". They bear an uncanny likeness to KFC's Popcorn Chicken, despite the fact that they were launched the following week. This page was last edited on 16 January 2018, at 23:19.